Barbara Lyon was the daughter of the former Hollywood stars Ben Lyon and Bebe Daniels. Ben and Bebe had started their careers in the days of silent movies, but reached the peak of their popularity in films during the 1930s. Ben had been an accomplished flyer- even piloting his own aircraft in his best known movie- "Hell's Angels". Ben joined the RAF during the early part of World War 2 and served on many successful missions. Although the family moved back to the USA they soon returned and made Britain their adopted home. It was during the late 1940s that they started their long running series on BBC radio "Life With The Lyons" and soon established themselves as an accepted part of the UK entertainment scene. All the members of the family played themselves including offspring Barbara and younger brother Richard. 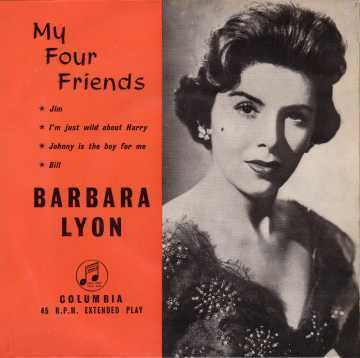 The EP illustrated here was released at the peak of Barbara's UK singing career in 1956. It contains four songs that the sleeve notes tell us were first performed by Barbara on her TV series 'Dreamtime With Barbara'. Sadly, her long term musical career never matched the early promise of her early chart hits and this EP with its wonderful photograph of Barbara is a very rare item indeed. Both Barbara and Richard launched their own independent show business careers during the 1950s. Although Richard did record one single, he had more success as a young actor- finding parts on both sides of the Atlantic. Barbara too did a little acting, but she had significant talent as a singer too and managed to reach the UK chart with her first two singles (the first of which, 'Stowaway' on Columbia DB3619 is probably not available on 45rpm) reached #12. Unfortunately, Barbara's chart career did not extend beyond the two hits and she spent the bulk of her entertainment life, before marrying, as an actress or in game shows in the USA. Ben returned to live in the USA following Bebe's death in 1971 and later remarried before his own demise in 1979. Sadly, Barbara Lyon died on July 10, 1995 in West Middlesex, England. Columbia SEG7640 1956 "My Four Friends"